Analysis Networking kit giant Huawei didn’t even make mobile phones four years ago, but its classy new P8 flagship shows what astonishing progress it’s made to come within striking distance of the market leaders. The Shenzen-based, employee-owned company unveiled its P8 at a huge, splashy launch in London’s Old Billingsgate Market. There isn’t a part of the P8 package that hasn’t been improved, with Huawei’s hallmark mix of brilliant boffinry, thoughtful design … and a bit of pilfering. Technically, Samsung deserves the laurels with its inclusion of a fingerprint sensor (a huge practical convenience) and wireless charging in its Galaxy S6 leader. Samsung just shades it with a slightly better (but not by much) camera and display (again, not by much), all in a dinkier, smaller package. In every important respect the P8 is right up there with the best. Given that the P8 is around £250 cheaper than the S6 (you should find it at around £350 compared to the £599 SIM-free Galaxy) then it becomes a pretty compelling contender. I reviewed the Galaxy S6 recently and concluded that it deserves its praise. For buyers for whom money is no object, then it’s a simple choice between Samsung and Apple. But more sophisticated buyers are threatening to shake up the market. For the past few years HTC, Sony and Samsung have all chased Apple’s pricing model with feature-crammed flagships costing over £600 or £700 that people acquire on hire-purchase via a financing deal from their network operator. Companies like Huawei, Lenovo’s Motorola and OnePlus can offer you an almost-flagship for a lot less, under £300 in each case. That £300 can buy you a lot of beer.
. Optional e-Ink cover displays messages, etc from device. Note that all three challengers are Chinese. All three eschew huge marketing campaigns; Samsung spends $15bn a year, which is more than Iceland’s GDP, and higher as a proportion of revenue than most consumer electronics or car companies. The Chinese also prefer to sell direct, which keeps the cost down. Huawei itself is the polar opposite of Samsung: it won’t borrow to spend - insisting that all of its Consumer division’s marketing budget must come from profits. Speaking to Chinese vendors at this year’s MWC, I think they may have overestimated the power of word of mouth marketing, and under-estimated the need to build up a brand. Understandably, in the booming Chinese economy, they didn’t need to. Perhaps some social media marketing hucksters have passed through and told them all they need to do is a few viral Tweets. It isn’t that easy. Note that Huawei, Lenovo and OnePlus are all Chinese, meaning they can draw on high skilled engineering workforce and sell into a still-growing home market. This week Which? reckoned punters are wasting more than £355m a year by not switching to cheaper tariff once their contract ends. But that’s a tip of the iceberg, really. Punters are paying for £600 phones when they don’t need one – and Huawei, Lenovo and the Chinese can now offer ones just as good for less. This requires some knowledge and sophistication from the buyer, of course. Sourcing phone and SIM separately, perhaps online. Even so, it’s one of life’s simpler decisions: it’s not like choosing an ISA, a school or a car mechanic. Uswitch identified flagship fatigue as one of 2014’s most significant developments. With phones as capable as Huawei’s P8*, I think it’s only just got going. The “Ascend” brand has been dropped. Huawei also showed off a giant 6.8 inch phablet, P8max, with a 4360mAh battery, weighing 228g. We'll post our P8 review soon. 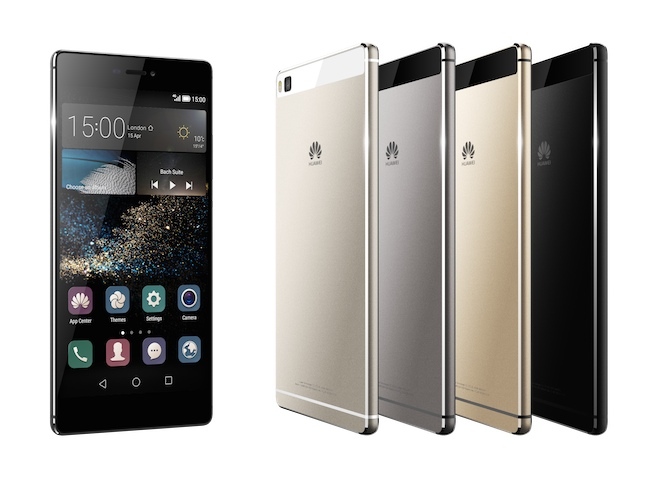 Huawei's flash-heavy P8 minisite is here, and a full list of specs here.